Learn about the ways people in your congregation care for each other. What happens when someone is seriously sick, or has a new baby, or has had a death in the family? Find out how news spreads that someone needs care and how the congregation reaches out to care for them. Help a committee or group that has caring duties with one of their tasks (for example, delivering greeting cards or preparing and delivering food). How does working together and individual acts of kindness combine to care for people who need help? How do caring activities help build a community? Do you see any ways to make your congregation’s caring activities better? Share what you have learned about caring in congregations with other people. Since good manners (also called “etiquette”) grow out of consideration for other people, read a book or article, or view a video, about manners. HINT: Go to your public library for suggestions of books and videos you can get from your library or borrow through interlibrary loan. If you or your parent or caregiver uses Pinterest, check for boards on the topic of manners for good resources. 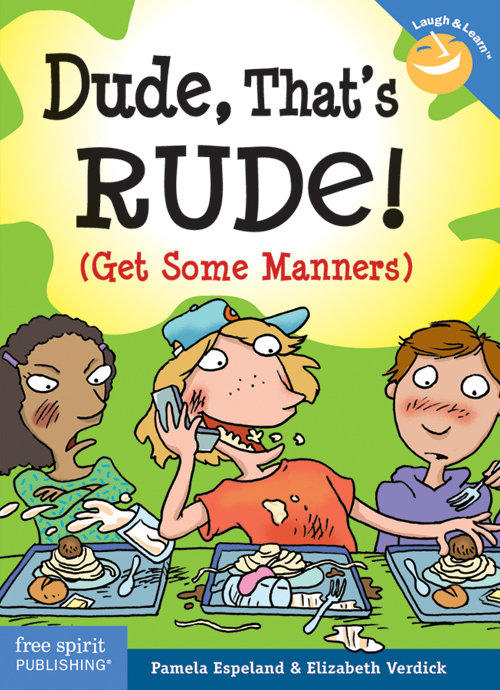 Recommendation: Dude, That’s Rude (Get Some Manners) by Pamela Espeland and Elizabeth Verdick, © 2007. Cover image used with permission of Free Spirit Publishing Inc., Minneapolis, MN; 800-735-7323; www.freespirit.com. All rights reserved. 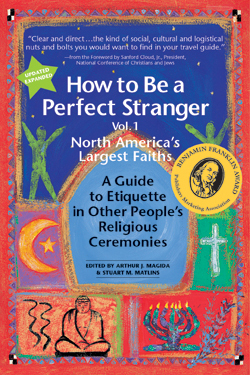 If the book or website you read or the video you watch doesn’t tell the history of some of the “manners” practices, guess why or how they might have started. If you did learn something about where a practice came from, ask yourself if the reasons and practices still make sense. How do you feel when people use good manners or bad manners with you? Pick three manners guidelines or practices and explain how each one relates to consideration and caring. EXAMPLE: At one time, people shook hands to show they were unarmed and others could feel safe around them. Now an open hand shows respect and an interest in being connected. Volunteer to serve as a greeter or usher for your congregation on at least one occasion. Talk beforehand to the adult in charge to learn what you should do, whether there is a particular way you should dress that day, and which manners are especially important to the task. Think about how your work helps show consideration for both the members of your congregation and visitors. What skills did you use to do a good job as an usher or greeter? Ask someone to take a photo of you as you act as an usher or greeter. Use the photo to help you share your experience with your advisor or with a parent, grandparent, or other adult who was not there at the time. Choose a congregation to visit that is not Unitarian Universalist. Learn about that religion before your visit. When you’re there, talk with someone from the congregation. Find out how your religious beliefs, customs, and congregations are similar and different. What did you learn about that religion by experiencing a visit to the congregation? How can you be considerate to people whose religion is different from yours? How could you help people from that religion feel comfortable and welcome at your congregation if they were to visit? Write a list, make a poster, or explain to friends or family members what you saw and heard and what you learned from your visit. Find out what your congregation does to meet the needs of those who have disabilities, such as difficulty walking, difficulty hearing, difficulty seeing, or severe food allergies. What does “accessibility” mean and how accessible is your congregation? Find out about good manners, also called “rules of etiquette,” related to disabilities. For example, How should people act around a service dog? What are some tips to follow when wheel chairs are being used? How can you be sensitive to people with food allergies? What can you do to help people with disabilities feel included and welcome in your congregation? How about your home? If you have a disability or other special difference, how can you get your needs met and help people unfamiliar with your situation feel at ease? 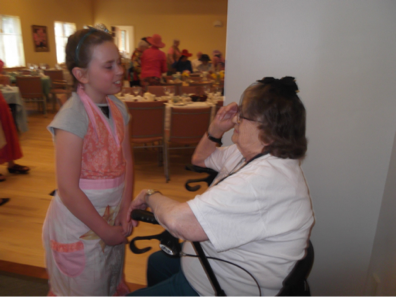 McKenzie, 11 years old, helping at “tea,” a gathering of girl scouts at a UU congregation who served tea, sandwiches, dessert, and talked with guests. List three new ideas that came to you while exploring and thinking about differences in abilities, or create a collage or other piece of art that showcases your new ideas. Attend a Unitarian Universalist child dedication AND/OR ask your religious educator about child dedications. How do families and congregations show caring for the child through this ceremony? If the child’s relatives are not Unitarian Universalist, what might they learn about Unitarian Universalism from the ritual? Describe the part of the ceremony that you like best or think is most important.